Spirit & Spark is hosting her special event for the "I am Love Tour"
Date and Time: Thursday, April 19 at 7:00 p.m. Cost: $25; Space is limited! Danika is a Crystal Singing Bowl Master Alchemist and Light Language Medicine Woomyn. Danika and the bowls become one healing resonance together following the energy of the participant and the group. She incorporates a variety of mindfulness techniques including breath, body awareness and sound into each session. Danika uses her empathic senses, intuition and subtle resonance abilities as she selects tones, light language and crystal alchemy bowls. Messages from guides, passed on loved ones, Angels and the higher selves of participants come through during these healing sessions. Each Crystal Alchemy Bowl is a Master Shaman and brings healing on all levels of the subtle bodies and physical body. The tones balance the hemispheres of the brain to bring stillness of mind and relaxation to the physical body for deep healing to take place. Danika has a lifetime of spiritual training including 16 years working Ancient Ritual, a B.A. 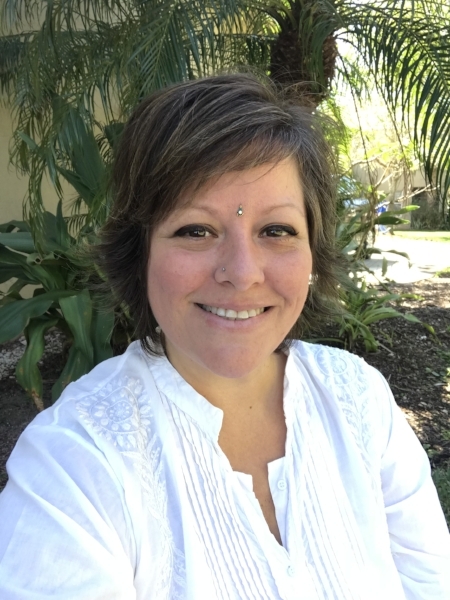 in World Spiritual Studies, 25+ years working as an alternative healing practitioner as a CMT, Certified Reiki Master, Certified Oneness Trainer, Certified Yoga Nidra Teacher and much more. She is a spirit medium and energy alchemist. Every session with Danika is totally unique and profoundly transformative. Danika's mission in life is to sing love into the collective and uplift all hearts. Danika is a Healing Master returned to love through the grace of these times. She is a Revolutionary for Love and travels the U.S. and abroad sharing the gifts of love that she has been given. All of the Crystal Alchemy Bowls Danika uses are available for purchase. Each Crystal Alchemy bowl is a Master Shaman. The medicine from the bowls can be felt energetically and through the resonance of the sound. The Crystal Alchemy Bowls will transport you into realms within yourself to bring in maximum love and light.